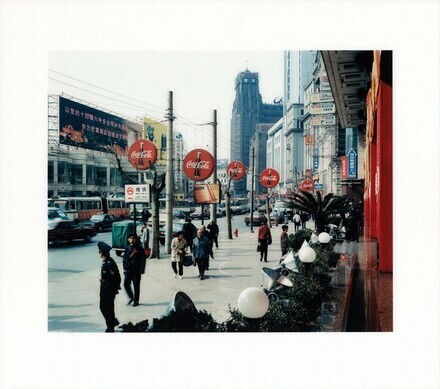 signed on label on back of frame: Thomas Struth / ed 4/10 / Wangfujing Dong Lu / Shanghai 1997; white sticker, upper right: 17 Nov 00 / Sale 9680 Lot 535; Christie's sticker: MR 17814 C.T.A. (Max Hetzler Gallery, Berlin); (sale, Christie's, New York, 17 November 2000, lot 535, sale 9680). Heather and Tony Podesta, Washington, DC; gift to NGA, 2009.